The stress caused by traveling with your furry friend should not be underestimated. And, yes, we are referring to both you & the animal in question’s stress. Every step of the journey can be an agonizing one. From the car ride to the airport, through check-in and security to the actual flight itself, result in endless hours of angst. A quality approved dog carrier such as a dog crate can make all the difference between either chaos or smooth-sailing during these events. As a pet owner, it’s your responsibility to make the air-based journey of your pet as hassle, stress, and drama free as possible. A pet carrier to house your animal while in transit is the surest way to accomplish this. The items you travel with should complement your experience, not feel like a burden. There is some debate as to whether pet carriers are in fact preferable to pet crates when traveling. 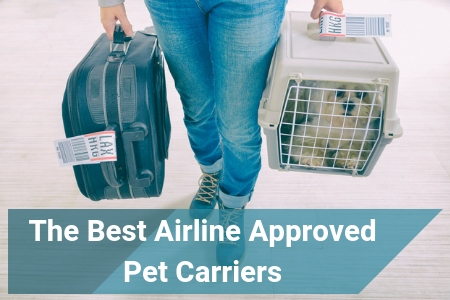 We took the time to dissect this notion as well as explore our four top picks for airline approved pet carriers on the market. Use this comprehensive guide to navigate your way through the pet carrier world. Take time in selecting the carrier that is just right for you and your pet. Why Do You Need a Pet Carrier? Traveling with pets is not a common occurrence. Those who do it regularly will understand being torn between intense enjoyment and intense worry the entire time. Having a pet on board or underneath an aircraft can be extremely disruptive to one’s peace of mind. Most of us are well aware of the toll that traveling can take on the body; the stiffness of limbs, popping of eardrums, altitude-induced nausea and so on. These are all good and well in the experience of the human body, but to imagine a pet going through them can be traumatic. Therefore, it is essential that, when traveling, you provide your pet with simple pleasures to ease their experience. A well-made pet carrier can assist with this. Pet carriers come in need during both local and international travel. While they are usually used during air-based travel they are equally as useful for trips in a car. Pet carriers house your pet for the duration of your journey. It’s essentially their haven and point of safety throughout this experience. 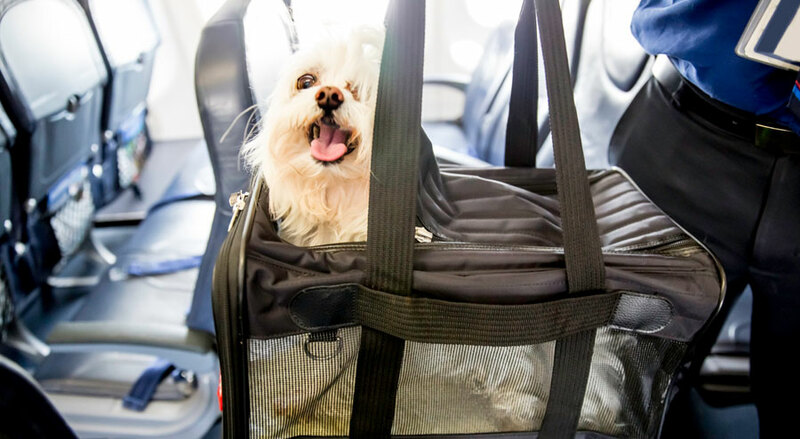 While in the air, your pet will be stowed in the luggage part of the aircraft while inside their carrier along with all the other pets on board. It is, therefore, vitally important that your choice of pet carrier be of sound quality and durability. Work pets: If, for any reason, your pet needs to accompany you to work one day a carrier would be absolutely necessary to keep them out of everyone’s way. Outings: Your pet can join in daily errands and outings through the use of a carrier. Beach days: Since it’s not always certain how an animal will behave at the beach, a carrier is a good way to ease them into the experience. Hospitals: On the rare occasion that a pet is allowed to visit their owner in the hospital (by doctor’s orders) then a pet carrier is essential. Show & tell: Children love to take pets to school and for this, a carrier can ensure the safety of both the animal and the children in the vicinity. Because of the nature of trends and style, pet carriers have become a creative outlet for many brands and pet owners. There are many brands on the market today offering diverse renditions of these devices. All these units can be grouped in two main categories: the soft bodied and the hard bodied carriers. Picture the teen rom-com where the popular girl carries her dog around day in and day out: the dainty looking pet carrier that rests over her arm that could pass as a handbag to an unknowing individual. Soft body pet carriers are made of fabric and padding. They resemble miniature tote or duffle bags with a single entry and exit point. Soft body pet carriers are dynamically space saving and easy to store away when not in use as they have the ability to fold up. These types of carriers are ideal for everyday use as well as during travel. They are, however, not heavy duty. It would require care on the part of the airline to ensure nothing is ever accidentally placed on top of them. Hard body pet carriers, sometimes known as pet crates, are the typical carriers that come to mind when thinking of pets stored underneath an aircraft. They are made of hard, durable materials and can’t be folded or stored easily. These carriers are far less luxurious compared to their softer counterparts. They are made to withstand the force and are usually resistant to wear & tear. Hard body pet carriers can be stacked and there is no threat to the animal should other things be stacked on top of them. Airlines usually prefer these kinds of carriers during transit as they are safer housing options during flights. The most common materials used in these kinds of carriers include plastic, wood, and cage-like metals. Hard body carriers are naturally much heavier than soft ones. When selecting a pet carrier to best suit your needs, there are a number of important features to take into consideration. The broadness of the pet carrier industry has seen the market saturated with styles and options. It can be hard to know which carrier is exactly right for you. Consider each of the following points and make your selection according to those features you value most. Though seemingly irrelevant, the exterior of your pet carrier is actually quite important. For starters, if you’re planning on using the device during travel, it’s imperative that you’re able to identify your carrier instantaneously. Losing track of your possessions in places as crowded as airports or foreign cities is not uncommon. Losing track of your pet, however, which is inside a carrier, is not acceptable. The exterior of your pet carrier should be as uniquely identifiable as possible. If you’re forced to pick a more generic looking device, then we recommend customizing it yourself one way or another. A bright piece of material tied to the handle or some plastic flowers wired to the cage can make a big difference. You should essentially be able to spot and identify a carrier as yours from a significant distance away, at all times. Equally as important as the exterior, the interior is solely for the enjoyment of your pet. There is nothing worse than a distressed animal during excursions. The interior of a pet carrier can help prevent this. Even if the carrier’s exterior is hard and durable, the interior should still be soft & comforting. Most carriers will have built-in padding for your cat or dog to enjoy. Others will require you to insert appropriate cushioning yourself. Take time to consider the interior of your pet carrier. Think outside of the box and look at even throwing in a light blanket or stuffed animal as an additional mode of comfort. If it’s an item he knows, the familiarity will help keep your pet calm. It’s likely that your pet will be in this carrier for hours on end. Therefore, make it as comfortable as possible. The style of the carrier is 100% up to personal preference. The spectrum of pet carrier styles is vast. Some pet owners prefer to use carriers that appear to look like a handbag. Other carriers offer the addition of a sling strap that gives the carrier more of a duffle feel. Hard body carriers usually don’t have any straps but rather just lifting handles on the top and sides. This is because they’re generally bulkier and can’t be carried the same as softer units. That being said, there are also equally as large and bulky soft bodied carriers on the market that feature the same sling bag style. The options really are endless. Above all, security of the unit is of the highest importance. It’s all good and well having a stylish, creative looking pet carrier but without adequate security, it's absolutely worthless. The entry and exit point of the carrier needs to absolutely tamper-& escape-proof. Whether it’s made with fabric, mesh, or metal, there can be no risk of accidental opening at any given point. There should also ideally always be a place for a lock and key feature. Neglect in this aspect of carrier construction can put both your pet and the people in the vicinity in danger. You also run the risk of losing your pet should they find a way to escape when no one is watching. There is also no harm in adding one or two cable ties to your unit while in transit, just as an additional security measure. Sometimes, the flamboyant nature of the pet carrier market can cause the devices to be less than convenient when porting around. Only you can say how easily portable your unit needs to be. If you’re not the type of person to carry many things at once you might consider a wheel-fitted carrier. If you struggle to carry things one handed then a back-pack style carrier (for smaller animals only) may be better suited. The portability of your carrier should also align with your physical abilities. If you have back problems a backpack type won’t work. Now, let’s show you some of the best ones on the market so you can pick yours. This practical design unit from Bergan carries like an overnight bag. It’s best suited to smaller pets and car-based travel; however, it’s airline certified should the need arise. 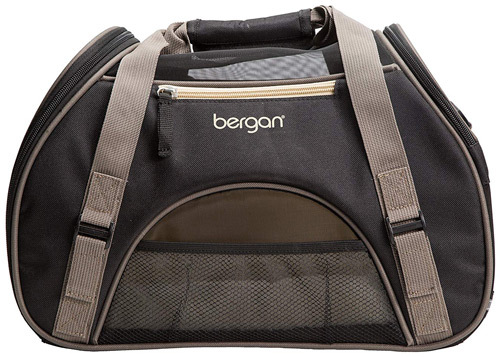 Bergan also offers the same carrier in a large size for bigger pets. We love the inclusion of multiple mesh panels for enhanced ventilation and breathability. Being on the inside of this unit will let the pet feel less claustrophobic than many others. The zipper entrance is lockable and tamper-proof. There is a loop in which a seat belt can be used to secure the carrier in place during transit. We also love the reflective strip for an added element of safety and identification in low light. The inside of the carrier is fitted with a bed made of fleece. It can be removed and machine washed when necessary. The bed is soft and comforting to any animal it will be used for. ​We particularly love that this unit from Voyager features a top-loading element. This is not often seen in pet carries anymore. 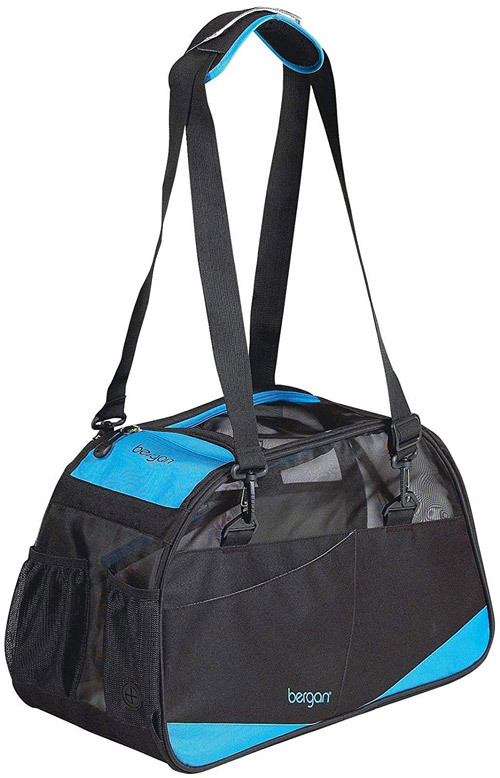 This carrier is suitable for pets ranging small to large. Its extended carrier strap makes it easy to port around regardless of the weight within. Not only does this carrier have space for your pet but also ample storage compartments for snacks, toys, and poop bags. It’s the perfect carrier for both everyday errands or flights across the country. It includes “no escape” locking zippers at all points of entry. The carrier also comes in your choice of four colors. This makes it unique and identifiable only to you. The interior is fleece-based. Because of the size of the carrier, there is space for additional comforts such as stuffed toys or pillows. ​This is an unusual yet incredibly stylish carrier from Multipet. The entire body of the carrier is sleek black in a quilted design. It’s trendy when compared to higher-end luggage styles. This carrier actually looks like just another piece of luggage. There is little to no indication that it might be housing an animal. It features a single entry and exit point, this is also the sole ventilation point. This carrier can hold animals 16lbs. and under. It is quilt padded inside and out for maximum comfort. 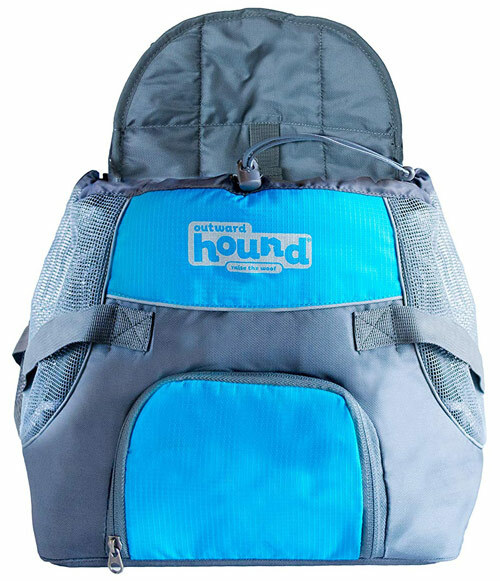 We enjoy this versatile carrier by Outward Hound. The carrier is designed in a unique way and sits on the chest of the pet owner, not on the shoulder or back. This is usually a method of carrying often seen in individuals with young babies. It works equally well for pets, it seems! The carrier is electric blue and your pet is loaded in from the top. Both sides are made of breathable mesh for excellent ventilation. Both the exterior and interior are cushioned so the pet and wearer experience comfort. This unit is best suited for animals 20lbs. and under; however, carrying a heavier pet is possible. The carrier is fitted with a number of pockets for additional storage. This is a great carrier for anyone traveling with a pet who may need both of their hands for carrying other luggage or personal items. Aside from being one of your pet’s only fashion statements, your pet carrier does provide a range of crucial advantages to your pet’s experience. Traveling or not, there are many advantages to investing in a quality, airline approved carrier for your animal. Health: Your pet is sheltered from any external elements that could negatively impact their health and well-being. Safety: They are in small, secluded spaces so you or officials can keep an eye on them. They are kept out of danger. Enjoyment: You get to enjoy the pleasure of having your pet accompany you everywhere you may go. While you’re in the market for the best pet carrier to suit your lifestyle, we encourage you to make use of this comprehensive guide to narrow down your search. Our exploration of four very different carriers will hopefully get you on the right track. While they were all of soft body nature, they all featured a vast array of different qualities. Which of these were of most interest to you? Look at your pet carrier as in investment to enhance your pet’s experiences as well as your own. Be critical and particular about the features you expect to have in yours. When you know what you need it becomes easy to identify the perfect one that will keep you and your pet happy. That’s all from us — bon voyage! 1 Why Do You Need a Pet Carrier?